Does PureCloud require a SIP proxy between the Edge and SIP provider? See Eliminate the SIP proxy between the Edge and SIP provider. 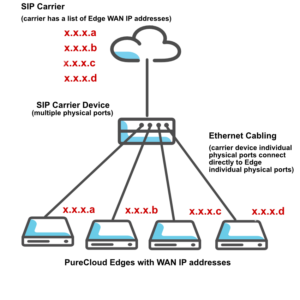 Based on the capabilities of the SIP provider, the Edge requires or does not require a SIP proxy between the Edge and the SIP provider. A SIP provider can sequentially roll calls, load balance, or percentage allocate between a list of IP address endpoints supplied by the customer. A SIP provider has enough individual physical network interface ports on the SIP carrier device to have a physical port available for each Edge. For inbound calls, the carrier distributes calls among the Edges. For outbound calls, Edges load balance with randomization. Note: Multiple Edges can process calls at the same time. You should not route calls to a single Edges but distribute the calls among multiple Edges. Determine that the SIP provider can sequentially roll calls through a list of IP addresses. Determine that the SIP provider has enough individual physical network interface ports on the SIP carrier device to have a physical port available for each Edge. Physically connect a single port to a single Edge for all Edges. Configure an IP address on the Edge interface using the PureCloud user interface. See Configure an Edge interface. Provide a list of your configured IP addresses to the SIP provider and request that the SIP provider sequentially roll inbound calls through those IP addresses. A SIP provider cannot sequentially roll calls through a list of IP addresses supplied by the customer. 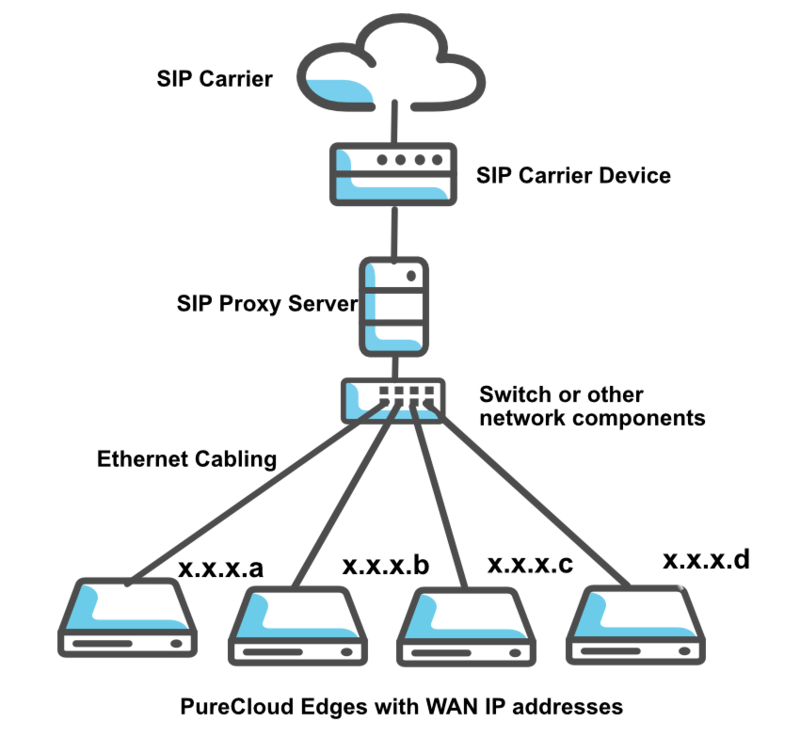 A SIP provider does not have enough individual physical network interface ports on the SIP carrier device to have a physical port available for each Edge. Note: A possible workaround to a lack of available ports is to implement a switch or VLAN tagging solution.